This is the ultimate guide to Bitcoin Privacy. Learn how to buy bitcoins anonymously and securely! How to spend it without worrying, and more! Of course, we'll show you how to buy the best VPN anonymously, however, the same process can be used to anonymously purchase pretty much any product that accepts Bitcoins. Do note, however, that physical products need to be delivered to a physical address and/or be collected in person. This is an updated version of a guide I originally published on this website back in 2013. Since then, many things have changed. The value of Bitcoin has shot through the roof, well-known trading websites such as Mt. Gox have closed down, and much more. In some places, you can now even buy Bitcoins from ATM machines! Bitcoin is the original cryptocurrency. It is a decentralized and open source virtual currency that operates using peer-to-peer (P2P) technology (much as BitTorrent and Skype do). Like traditional money, you can trade Bitcoin for goods or services (such as a VPN subscription) and exchange it for other currencies. Unlike traditional currencies, however, there is no “middleman,” such as a state-controlled bank. Here is my new Electrum Bitcoin wallet. If you're feeling generous, you can always send some Bitcoin to me using the address shown above! A major downside with Electrum is that it discloses information to a third party. It uses central servers that can associate your payments together and log your IP address. Electrum is available for Windows, macOS, Linux and Android, but it is not available as a web wallet. Reviews for the Android version of Electrum in the Play Store are disappointing, so I will stick with the Windows version. If this was purely for personal use, I would use the Linux version. However, Windows has a much wider audience in terms of those reading this guide. A good introduction to installing and configuring Electrum on Windows is available here. A good beginners’ guide to using Electrum is available here. When downloading any wallet from the internet, be sure to verify its digital signature. There are many ways to buy Bitcoin anonymously. These vary depending on which country you're in. It is therefore probably best to search online for options available in your area. How to Buy Bitcoins provides an excellent list of resources for almost every country. 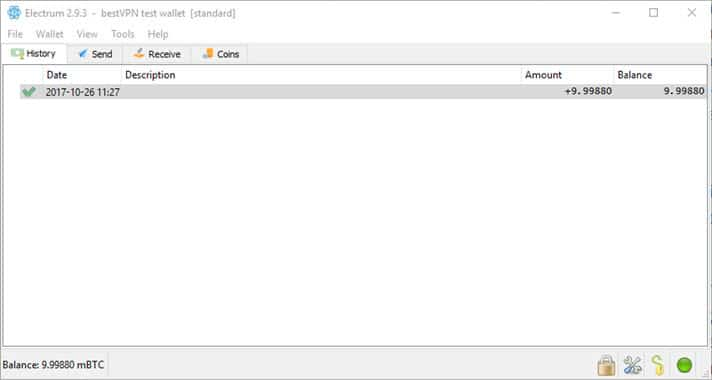 This is not the most anonymous method of buying Bitcoins, but it is the most convenient. It does nevertheless ensure a fairly high degree of anonymity. Using this method, you do not actually buy Bitcoin anonymously at all. You simply purchase it from an automated Bitcoin exchange such as CoinBase. To make the Bitcoin more anonymous, you then launder it using a “mixer” service. A mixer service basically anonymizes your Bitcoin by swapping it for other Bitcoin that has no connection to you. This makes it very difficult to follow the chain back to you. Difficult, but not impossible. Bitcoin laundry services are, of course, not free. Almost all automatic exchanges require you to prove your real-world identity. In this case, it is easy to determine that you've purchased Bitcoin, but not what happens to it after it has been mixed. I will look at mixing Bitcoin later in this guide. You can also mix Bitcoin that has been bought more anonymously in order to further increase its anonymity. Websites such LocalBitcoins.com or the #bitcoin-otc IRC chatroom on Freenode (otc = over-the-counter) allow you to meet private Bitcoin sellers online. You can buy Bitcoin anonymously in this way without registering your real name anywhere. As the seller is a private individual, tracing the transaction is much more difficult than if it was done through a big, centralized exchange where everything is recorded. #bitcoin-otc uses a fairly involved feedback system. It is well worth taking the time to understand this. You'll need to hash out the payment method with the seller. A list of IRC clients is here. Private sellers may accept all sorts of payment methods – up to and including meeting up in person for cash payment. There are now many places in the world where you can buy Bitcoin by inserting cash into an ATM machine. If you wish to use a Bitcoin ATM as anonymously as possible, be sure to pick one that doesn't require any form of personal validation (this is up to the ATM operator). For comparison, here are prices in USD. On 25 October 2017, CoinBase listed the price of a Bitcoin at $5,482.36. As you can see, prices listed by individual LocalBitcoins.com sellers are a significantly higher than this. Such is the price of privacy. It is increasingly common for sellers to require that buyers prove their identity. While I am sure there are many perfectly good reasons for this (such as combating fraud), this runs counter to the idea of buying Bitcoin anonymously. I, therefore, filtered results with the 'SMS not required' and 'ID not required' filters. Note that even with these filters selected, many sellers did, in fact, ask for ID in their small print. Others would not sell to VPN or Tor users. This seller is not the cheapest available, but has 500+ trades with a 98% feedback score and requires no ID check. He also permits purchases when using a VPN or Tor, although use of Tor is not recommended.For the purposes of this guide, I’m going pay via bank transfer. It's easy, but still affords a fair degree of privacy as I'm dealing with an individual private seller. Plus, I plan to launder the Bitcoin afterward! I found plenty of sellers who accept various forms of cash and/or store card payment from anonymous buyers. It's worth noting that, in general, the more anonymous the payment a seller accepts, the higher the cost per Bitcoin - and the higher the risk of losing your money.The price for paying with Amazon Card Codes was over twice the going exchange rate for Bitcoin. The requested coins are held in escrow (that is, temporarily by LocalBitcoins.com) until the seller receives payment. You must make the payment before the payment window finishes, or LocalBitcoins.com will cancel the trade. This escrow system is designed to protect both buyers and sellers. If either side in a transaction reports a problem, LocalBitcoins.com will hold onto the Bitcoin until both sides are happy. If required, it will provide arbitration. 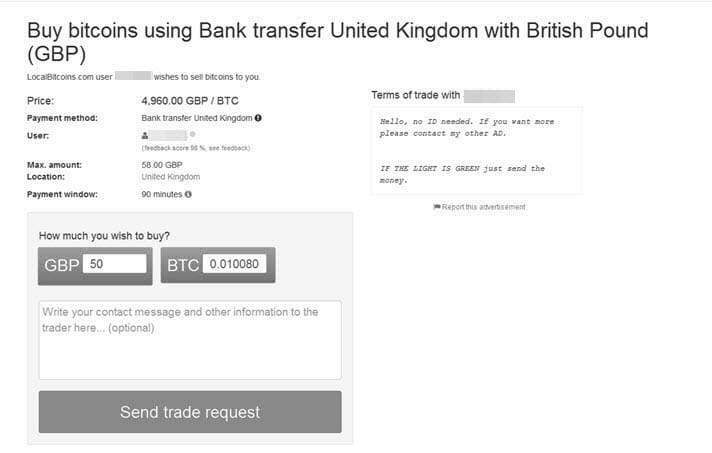 Paying by bank transfer is not very anonymous, as the seller will receive a bank transaction number. However, I plan to further anonymize the purchase by transferring the funds to another wallet and then laundering them. Once you've paid the seller, there is usually a short wait for the transfer process to complete and the payment to be confirmed. Once the seller has confirmed the payment, the Bitcoin is released from escrow and credited to your LocalBitcoins.com wallet. LocalBitcoins.com creates this when you set up a new account. 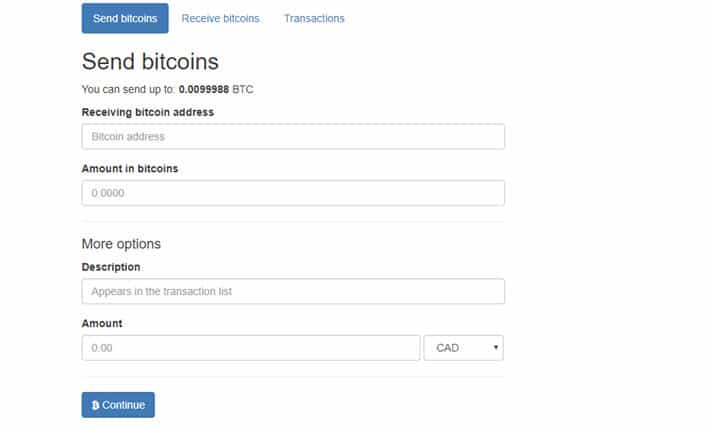 You can check out transactions in your LocalBitcoins.com wallet. Like eBay, LocalBitcoins.com relies on a reputation system. You are therefore expected to leave feedback on the seller once a trade is complete. Although not strictly necessary if you just want to spend your Bitcoin openly, this improves both privacy and security (assuming you keep your private wallet somewhere secure). For maximum privacy you should create a new wallet address each time you transfer funds. This helps prevent an adversary from linking different Bitcoin transactions you make together. Sending Bitcoin to your wallet (or anywhere else, for that matter) is easy. Just enter your wallet’s address and the amount you wish to send. Note that transfers are subject to a Bitcoin network transaction fee. After a few minutes, the Bitcoin should appear in your personal wallet (wallet #1). Yay! If you are concerned that interested parties might actively trace your Bitcoin transactions, you should now create a second new wallet (wallet #2) and transfer your funds into that. It isn't hard for an adversary to trace transfers from wherever you bought the coins to wallet #1. 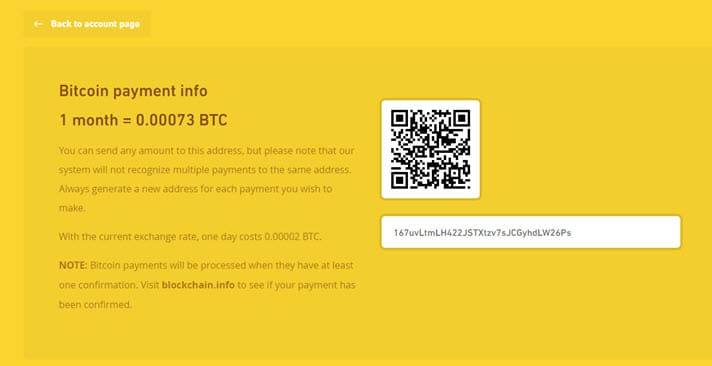 For example, LocalBitcoins.com knows the address of wallet #1. By sending the coin from wallet #1 to wallet #2, you can reasonably claim zero knowledge of, or responsibility for, what happens to funds in wallet #2. All you need is a plausible excuse for why you transferred the money to another person. If you plan to mix your Bitcoin, wallet #2 should be created on the Tor Hidden Services dark web. Electrum is good for this as it supports Tor. Depending on your threat model and how anonymous your initial purchase was, you can now start spending your Bitcoin. Alternatively, you can further improve anonymity by mixing the Bitcoin before spending it. The idea behind mixing Bitcoin is to confuse the trail of transactions. This is important if you value privacy, since the Bitcoin blockchain is a public ledger that records all transactions. The mixing process divides your funds into smaller parts and mixes them with random small parts of other people's Bitcoin funds. You end up with completely new coins. This helps to break any link between you and the coins you purchased. Mixing Bitcoin is particularly useful if you've openly purchased your Bitcoin, meaning that someone could easily trace your transactions back to your real identity. If you've already taken steps to purchase the Bitcoin privately, mixing might be overkill. It will, however, help further anonymize your Bitcoin payments. It is worth noting that properly mixing Bitcoin will help protect you not just now, but also if future tools and techniques can trace historic Bitcoin transactions. The best beginners guide to the complex issue of Bitcoin mixing that I know of is published by Bitcoin Blender (but is not specific to that service). Key points about Bitcoin mixing are summarized below. However, I strongly recommend you read through the Bitcoin Blender document, as it goes into much more detail on this highly specialized subject than what is within the scope of this general guide. In order to mix Bitcoin, you need a Bitcoin mixer service (also known as a Bitcoin tumbler). DIY methods of mixing Bitcoins do exist using websites such LocalBitcoins.com. This is not recommended, however, as it does not really remove the taint and it may require trusting websites that are subject to legal warrants for information. Using CoinJoin can help improve anonymity when DIY mixing, but should only be considered if you really know what you are doing when it comes to Bitcoin and blockchain analysis. Bitcoin mixers are centralized services that keep large reserves of clean Bitcoin. For a service fee, they allow you to swap your Bitcoin for clean Bitcoin. Bitcoin mixers come in two basic flavors – Tor mixers and clearweb (regular internet) mixers. Tor mixers exist only on Tor Hidden Services (aka the dark web), and are therefore the best option for maximum anonymity. On the downside, the operators of these services are themselves anonymous. This means that there is nothing to prevent them disappearing with your coins! In addition to this, Tor mixers are particularly vulnerable to phishing scams (see below). Clearweb mixers exist on the normal internet. Most of them are legally registered companies. This means that they can be subpoenaed for transaction information. However, many such services promise to keep no logs or personal information. The main advantage of clearweb mixers is that they are much less likely to just abscond with your money (although nothing can be 100% guaranteed). Their use of regular HTTPS certificates also makes it much less likely that you will become the victim of a phishing scam. You can, of course, connect to clearweb mixers using the Tor Browser or a VPN to hide your IP address from the mixer. This is will improve your privacy, but is not as anonymous using a Tor mixer. The advice issued by LocalBitcoins.com about the dangers of transferring Bitcoin funds over Tor also holds true here. The internet is flooded with fake links to Bitcoin mixer sites. Even popular, high profile websites can carry fake phishing links. Most clearweb mixer sites use HTTPS. If the domain names looks legit and the website has a valid HTTPS certificate (look for a closed padlock in the URL bar), then the site is almost certainly genuine. The same cannot be said for Tor mixer sites, which don't have clearly recognizable domain names or use HTTPS certificates. Indeed, some phishing websites look very convincing, so that even users familiar with the genuine website might be fooled. To the best of my knowledge, the links provided in this article are genuine, but I take no responsibility for them. Please do your own research before trusting any website with your Bitcoin. Randomized Service Fee – because a fixed service fee on the blockchain may provide a clue as to which mixer service was used. Randomized Delay – this makes it difficult to tie together transactions entering and exiting your wallet. Multiple Withdrawals – this allows you receive the mixed coins using multiple transactions and multiple wallets in order to hide the transaction. For maximum anonymity, you should take advantage of all such available features. When mixing Bitcoin, “taint” is the connection between your old coins and the new ones. 0% taint = no connection at all. In the past, Blockchain.info offered a free “taint analysis” tool that allowed you to manually check for taint. It has shut this tool down, however, and at the time of writing, no real alternative exists. The service fee is not random, but I can live with that. More important for the purpose of this guide, is that trades require a fairly low minimum of 0.01 BTC (as it was, I had to top the funds in my wallet up a little for this step). You can register for an account, but I opted for the Helix Light (quick mix) option. 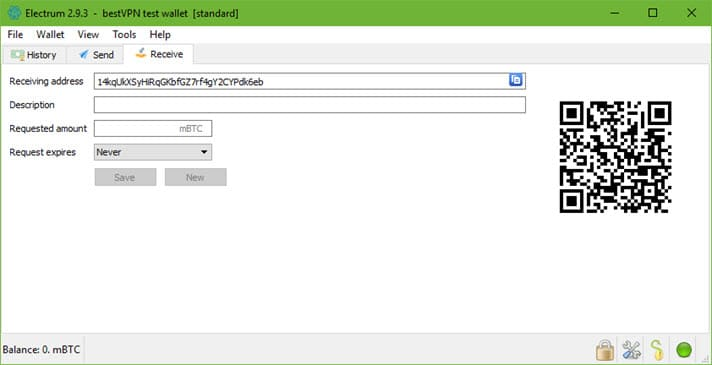 Create a new Bitcoin wallet, to which the newly mixed, untainted Bitcoin will be sent. Let’s call this mixer wallet #3. I will be mixing funds stashed in wallet #2 that I created earlier. Grams Helix is a Tor mixer, and is therefore only available via the Tor Hidden Services network. Thus I fire up the Tor Browser and visit (http://grams7enufi7jmdl.onion/helix). 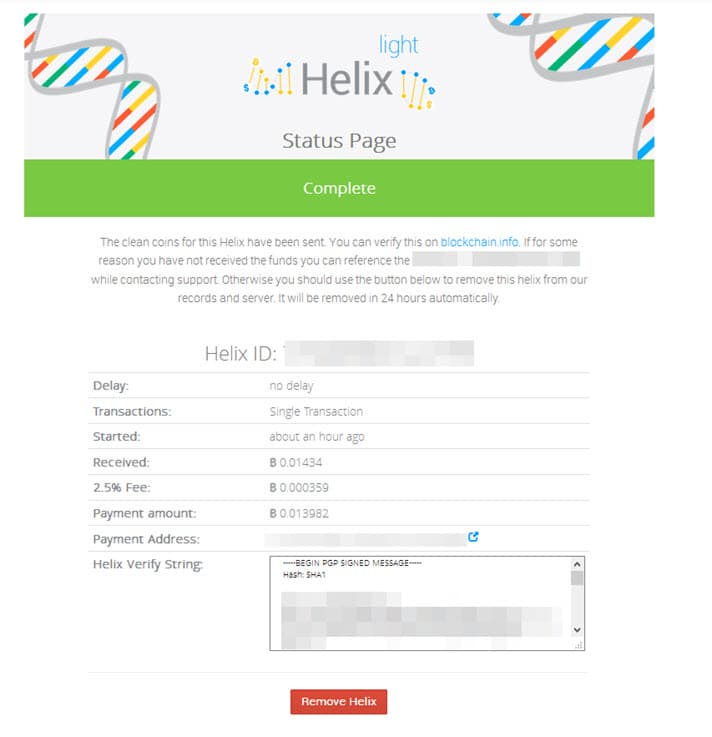 In the Helix Light tab, just enter the Bitcoin Wallet addresses that you would like the coins sent to (mixer wallet #3, in my case). You can have the coins sent up to five addressees to help obfuscate the transaction. You are then provided a Bitcoin wallet address to send your “dirty” coins to. I sent these from wallet #2. 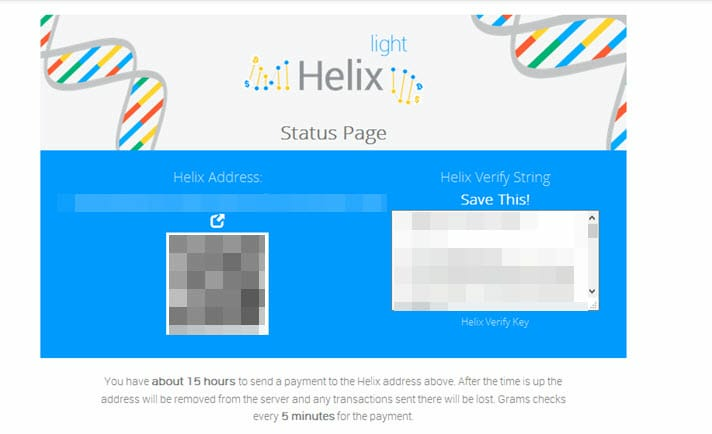 Helix also provides a PGP key that verifies the receiving wallet it created for this transaction. Save this key in case there are any problems and you need to prove the transaction occurred. I simply pasted the PGP key text into a text file on my computer. Once the transaction is successfully completed, this can be safely deleted. Refresh the webpage to see confirmation that the payment has been received (you may need to wait a few minutes for this). You can then increase anonymity by adding a random delay (1-6 hours) and/or send to multiple wallets. Both these options are recommended. Refresh or bookmark and revisit this web page for final confirmation when the transaction is completed. You should now see the mixed Bitcoin in your wallet (mixer wallet #3 for me). 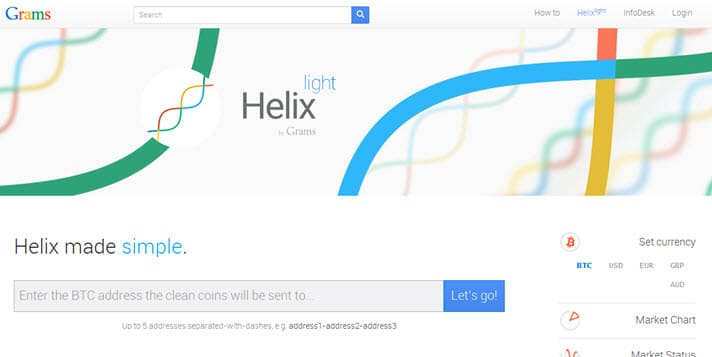 Once you have verified that the Bitcoin is in your wallet, hit the “Remove Helix” button to erase all record of the deal from the Helix servers. Then transfer the funds away from the wallet into which you received the mixed funds, into yet another wallet. Just to be sure. I would then check the mixed Bitcoin for taint, but there currently appears to be no way of doing this. Regardless, the Bitcoin should be well mixed by now. Now that you have some highly anonymous Bitcoin, it’s time to spend it! As this is BestVPN.com, you can use it buy a VPN subscription, but the process is similar whatever you buy. If you're buying a VPN subscription, please remember that although payment may be anonymous, the VPN provider will always know your real IP address. You are therefore never truly anonymous. The one exception to this rule is if you use VPN through Tor combined with an anonymous payment method such as properly mixed Bitcoin. This can allow for true anonymity when using a VPN because the Tor network hides your IP from the VPN provider. AirVPN is the only VPN service I know of to support this feature, however. Note that the process for paying with Bitcoin varies quite considerably from provider to provider. I have chosen to use Mullvad for this example. Register for a new account or sign in to an existing one. On the My Account page, select the Bitcoin tab, choose how long you want to pay for, and hit the “Request payment info” button. Mullvad will generate a one-use wallet. Send the money to the address given. Once the Bitcoin payment has received at least one confirmation, your account will be credited with the time purchased. Enjoy! Bitcoin is not inherently anonymous. Far from it, in fact. With some effort, however, it can be made highly anonymous (there is no such thing as 100% guaranteed anonymity). In my experience, buying and mixing Bitcoins was a painless process, but it does require some work. Is it worth the effort? Only you can decide that. I really like your work, and appreciate it. Your articles are always well thought out, clearly presented, and explained with facts and logical reasoning . Thanks. I think I may be a bit pedantic; you state "For maximum privacy you should create a new wallet each time you transfer funds". I define a wallet as a container that holds wallet addresses. I think you really meant that you should create a new wallet address each time you transfer funds. If I am wrong, then can you explain why a new wallet is required. Hi Roger, Thanks! I must say that the phrase sounds fine to me, but I do follow your logic. And yes, it is a new wallet address that is required (or at least strongly recommended). I have updated the article to clarify "a new wallet address." 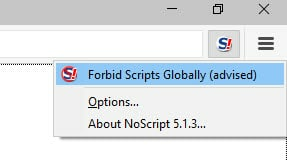 Browser Tor + online wallet https://bitcoinov.org - and will be 100% anonymous.